Among the many seductive pieces in Jack Cunningham’s recent exhibition Brooching the Subject in the Travelling Gallery, the one which spoke to me most beguilingly was a brooch consisting of a silver frame containing an apparently random selection of found objects or readymades: a 5cm. fragment of a wooden ruler, a moonstone with a face carved on it, a small ivory rabbit, a Lego brick, a marble, a shell, a coral heart. Later on I acquired the brooch, and decided that I would try to find out how, or if, it spoke to other people in the same way, or perhaps conveyed another message altogether; I wanted to find a way, via one of Jack’s own pieces, to think about the wider implications of Narrative Jewellery as a speaking object form with a meaning for the maker and the viewer, and whether the viewer needs to know anything about the history of the piece, or about its maker’s intentions, or indeed about the wearer. This piece was not made for me, so I started from the same position as any other viewer. I hoped that what happened to us would in fact inform me at first hand about how this kind of jewellery works as a genre, and so say something about all the work exhibited in Maker-Wearer –Viewer. Over a period of about a fortnight I wore the brooch in family contexts, when teaching, out to lunch with a friend, to a meeting of the University of Glasgow Senate, to vote in an election, while examining in two other Universities in two different disciplines, while visiting a well-known contemporary applied art gallery, and out and about shopping. I simply wore the brooch and waited to see what came back to me, and it never failed to elicit spontaneous comment or questions. The only differentiation I made in the conversations I had about it was whether I told the viewer that the brooch has a title, and what it is. I am grateful to everyone who so willingly entered into the spirit of the game. 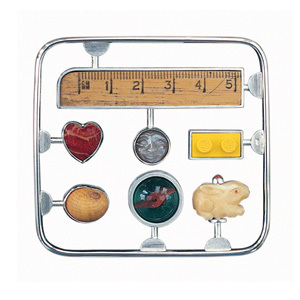 In fact the form of the brooch is very recognisable to those familiar with Jack’s work as one of his Kit forms; some of these, such as Love Kit Red and Love Kit Blue, play with a colour; others, to which mine is more closely related, assemble a group of illustrative objects around an idea – Travel Kit, for example. Some of the individual objects appear more than once: I have more of the moonstone faces elsewhere, and I have seen the rabbit in triplicate in a brooch called Menagerie à Trois. One strand of reaction, then, exists for those who know the maker’s work and are interested in spotting themes and variations. One of my most rewarding encounters was with another voter, unknown to me, at the polling station, who recognised my brooch straight away as a piece by the man who had those shows at the Lighthouse and in the Travelling Gallery. The shows had had an immediate appeal to her children, who related instantly to their imagery and to the way in which the pieces were put together from things they recognised, liked, owned and understood. So one sector of the audience is clearly working from familiarity with the components of the idiom; this evidently dovetails closely with the stylistic recognition I was getting from another angle. Recognition of some sort may be an important factor, then. Other encounters were with an audience which was much less familiar with the work, and with non-abstract forms of jewellery, though many of them know me very well, and have become aware that I rarely wear jewellery without intent. There was only one real admission of defeat in interpreting the piece, from a distinguished academic in an intensely verbal discipline, who could not construct a viewing methodology which allowed access either via the individual components, some of which he could identify, or the assemblage as a whole. Interestingly, his main reaction seemed to be frustration. Since the components were physically related, most viewers set about connecting them with one another, to find links or patterns or pathways. Some were much more abstract than others, or became so after exploration of the more obvious concrete reactions. Most people wanted to find a theme which used all the items, and I observed that there was quite a strong tendency to view them as a set of signifiers for something beyond the incidentals of immediate presentation. So the rabbit and the moonstone became linked with each other and sometimes the heart as standing for young love, or early emotional experiences. In this they went a developmental step forward from the Lego and the marble as toys of small childhood, and the ruler as a symbol of school, and the assemblage was about growing up. An ingenious colleague separated out the materials from which the items are made, and pushed the discussion in the direction of a contrast between the ephemeral and the permanent, or the natural and the artificial or fabricated. Another thought that it might be about the things we learn instinctively or emotionally as opposed to those we learn by formal process or logic – the move from rabbit to ruler, so to speak. 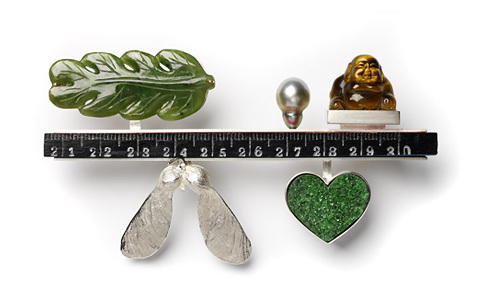 Some set these things in the context of growing and learning, and so the brooch is about childhood, to which the shell, the rabbit and the heart – holidays, pets, and love – lend an emotional colour. And then, of course, the desire to find a single interpretative framework led to a look, literally, at the frame and form of the piece. The recognition of the Airfix kit usually came at this stage, rather than first, interestingly, and usually, perhaps predictably, from middle-aged rather than younger viewers. My brother, to whose fiftieth birthday party I wore it, was among those, though he and a much younger colleague also said that it made them think of Kim’s Game, that party piece involving a memory exercise about the contents of a tray of randomly assembled objects, seen briefly and then covered. This process of exhibiting a single example of an increasingly important aspect of contemporary practice produced responses which clearly apply to the work of all the makers in Maker-Wearer-Viewer, and parallels in their reception. Whatever the maker thought he or she meant by the artefact is one component in what becomes a network of intentions and readings generated by the wearer and the viewers; all the work in the exhibition has that starting point, and a large part of its fascination is that its meaning cannot remain static. What may start with the maker as a brave emotional exposure, or a discussion of a treasured theme, or an act of provocation, or a joke, soon acquires archaeological deposits of other thoughts about it. As a wearer, I find myself assuming, as a matter of course, that that onward shift of meaning is going to be one of the pleasures, and indeed one of the responsibilities, generated by the act of putting a piece on. The act is in itself one of intention: to establish dialogue with the viewer, to say something about oneself, to talk about a shared experience, and to play games with acts of recognition and memory in others, and their assumptions about the wearer. The exercise I have described here proved to be a fascinating exploration of the viewer’s capacity for reading visual information, for creative association, and for emotional or intellectual responses to what can be a very explicit or a very ambivalent visual form. A shared cultural background is evidently an important factor which conditions responses; it will be interesting to see whether the diverse traditions represented in this exhibition add up to a sense of a European perspective. I was interested to find that I, as a wearer, and this brooch, as an example, provoked a variety of reactions which go to show that the language of visual objects is one which can be used and enjoyed by most people, who actively want to solve a visual puzzle or understand an idiom which uses components they can recognise and assemble in a structure of their own logic. They generally do not find the experience intimidating; actually, it is fun and games. I expect to find that this kind of visual play is a language which will work for all the makers and countries represented here. This can only be an encouragement to the maker, as it certainly is to the wearer. Why did this particular brooch appeal to me? Well, I belong to the generation which assembled Airfix kits and played Kim’s Game. I am a fan of Duchamp and later constructors of readymades. I have an interest in Cabinets of Curiosities and Theatres of Memory, both assemblages of objects which speak to each other and to the viewer. And I find multivalent work instantly appealing. The brick, the rabbit, the marble and the shell all conjured up memories of childhood encounters with the beach, toys, small furry animals, and of the school in which I learned more about them and other things; the moonstone face has appeared in Jack’s work before as a signifier of family, and the ruler of the passage of time; the coral heart stands for love of all sorts. Gradually, therefore, and from a number of angles, the language of the brooch became familiar and evocative. For me, though, there was one step further: I am an archaeologist with a particular interest in objects. The rabbit and the moonstone face might stand for animal and human remains, the brick and the marble for buildings and artefacts, and so together as the materials of archaeology. The heart symbolises the commitment which makes it a humane discipline as well as a science, and the ruler stands for methods of measuring time and space. So the brooch has several frames of reference, some with a more generic appeal, some more personal. I love it for all of them. Oh, and its title? Memory Kit.